Behind a long wooden fence, tucked away in the seclusion of the woods, you’d never know you were just minutes away from busy Boonsboro Road. 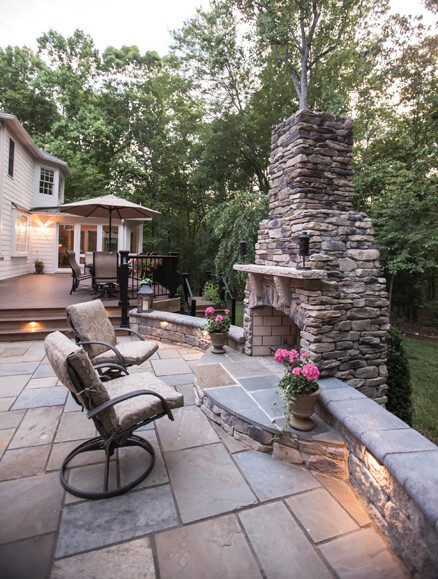 The privacy of the lot captured the attention and hearts of Gail and Luke Van Dyke, who moved to Lynchburg from Abingdon nearly a decade ago. At the time, Luke, a now-retired anesthesiologist, had accepted a part-time position at UVA teaching residents while also working part-time at Lynchburg General Hospital. His brother, a cardiologist, was here in Lynchburg, had children in DC and at UVA and the youngest was still at home. “It was a good time to move,” explains Gail. Upon entering the Van Dyke home, visitors are greeted with rays of sunshine pouring in from the home’s many windows. A turn to the left brings visitors to the formal living room, with color bursting forth from the yellow and pink floral window treatments and soft green sofa. Above the sofa hangs an oil landscape—the inspiration for the room’s palette. The painting, a depiction of the Teton Mountains and a field of wildflowers, comes from the couple’s trip to Jackson Hole, Wyoming several years ago. An upright piano sits beside the door. “All four of our children learned to play the piano, and our two boys particularly liked it. We enjoyed hearing all of them practicing pieces for lessons or recitals and playing their favorite songs at Christmastime,” Gail says. That piano, along with several other pieces, has moved along with them over their 35 years of marriage. 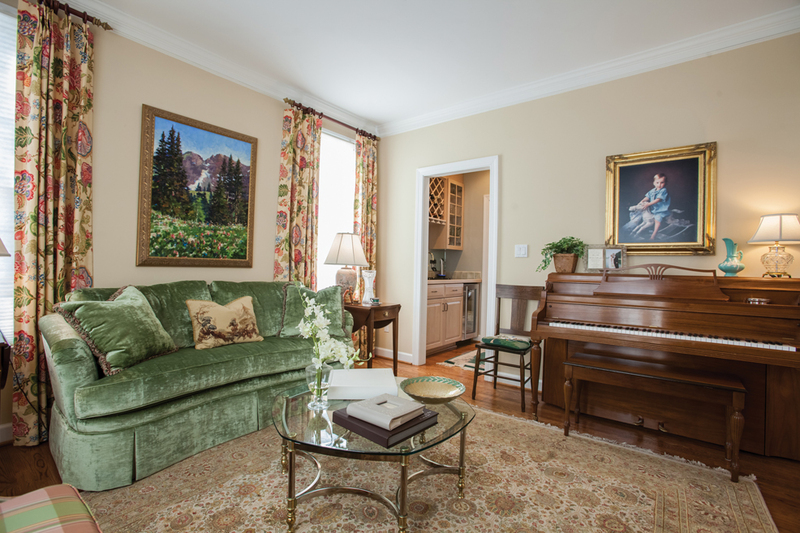 Cherished memories are on tasteful display throughout the Van Dyke home, particularly in the formal dining room that sits across the hall from the living room. A soft, romantic space with touches of pink, the grand crystal chandelier that hangs above the dining room table resembles an heirloom piece from a plantation home. “Actually, our first home had that chandelier, so we kept it! We took it with us and it has moved everywhere with us over the past 30 years,” Gail says. The focal point of the room is the arc of vintage pink dishes that creates a wreath-like effect over the dining room hutch. Luke found the set of 1940s china at an estate sale and recognized the set as being from Cumbo China in Abingdon; he shares a story well-known around Abingdon of Eleanor Roosevelt’s purchase of that same pattern (Mrs. Roosevelt’s set was blue and white, according to the tale). More treasured memories lie in the hand-embroidered tablecloth given by Luke’s mother, their daughter Stephanie’s wedding portrait, Luke’s grandmother’s hutch, and a sideboard made by a furniture-maker friend in Abingdon. Clearly, family and memories are at the heart of this home, from the furniture to the artwork to the design. 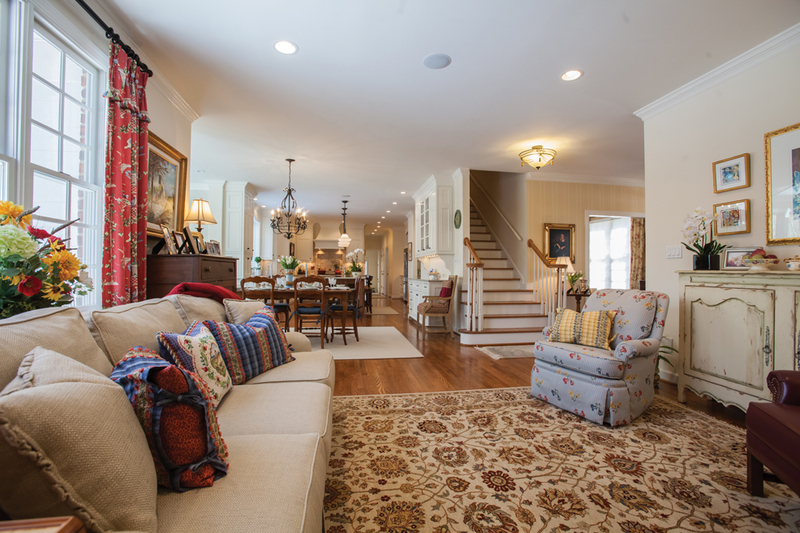 In fact, it was because their family is growing larger that Gail and Luke decided to make some changes in their home to accommodate their growing family. They are proud parents to four grown children, and grandparents to five grandchildren all under the age of 3 (the oldest is 2 ½ and the youngest just arrived in October 2015). “We simply needed more space,” says Gail. 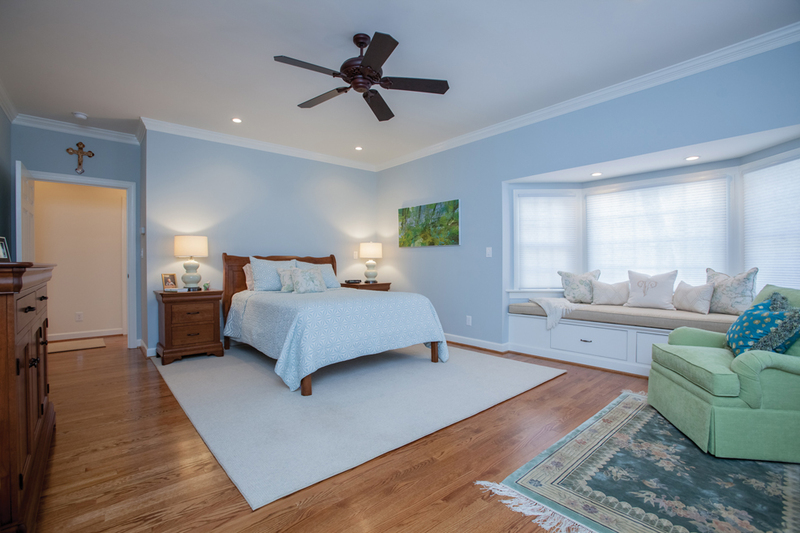 Luke agrees, explaining, “We were looking at the long-term and wanted to be able to live on one level.” With the future in mind, they decided a main-level master bedroom would be a good idea. The couple set about shopping the real estate market, but “couldn’t find anything with a really great kitchen and a main-floor master suite,” Gail explains. Plus, they liked their current neighborhood and the privacy of the lot. Luke adds, “We’d always figured we could renovate it the way we wanted to since it was all under one roof.” Thus, they decided to renovate. What used to be a narrow kitchen and garage is now a wide, open gourmet kitchen and a master bedroom with deluxe master bathroom. The new kitchen is every home cook’s dream space—it rivals the beauty and function of any kitchen you’d see on Food Network. The Van Dykes employed the skills and artistry of L.G. 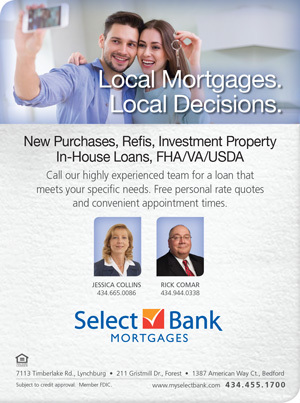 Flint General Contractors, who also renovated Luke’s brother’s house. The showpiece of the kitchen is the 11-foot island, whose countertop was fashioned from one solid, seamless piece of granite. Complete with a rinse sink, the darker walnut cabinets and drawers within the island contain a vertical filing system for baking pans and cookie sheets, a spice drawer, and what Gail refers to as her baking center. “I love to bake, make cakes, pies, sourdough bread, sweet breads, scones, and of course lots of cookies for the grandchildren,” she says. Behind one side of the island is a large cabinet-level Jenn-Air fridge, an ice maker, a wall oven, and a warming drawer. The new kitchen provides an abundance of space for storage and display, and the Van Dykes use two side counters for a tea service station and coffee station. Across from the island is the new Thermador six-burner gas range, which has one of the widest ovens on the market—that’s what drew Gail and Luke to it. “It’s my favorite!” Luke says. Gail likes it for its width, “but it was also the prettiest one!” she admits with a smile. Luke loves using the range for his specialty in the kitchen: fish and seafood, particularly salmon. “I can make you salmon any way you want it,” he proudly states. A ledge sits behind the range along with a wall-mounted pot-filler faucet. 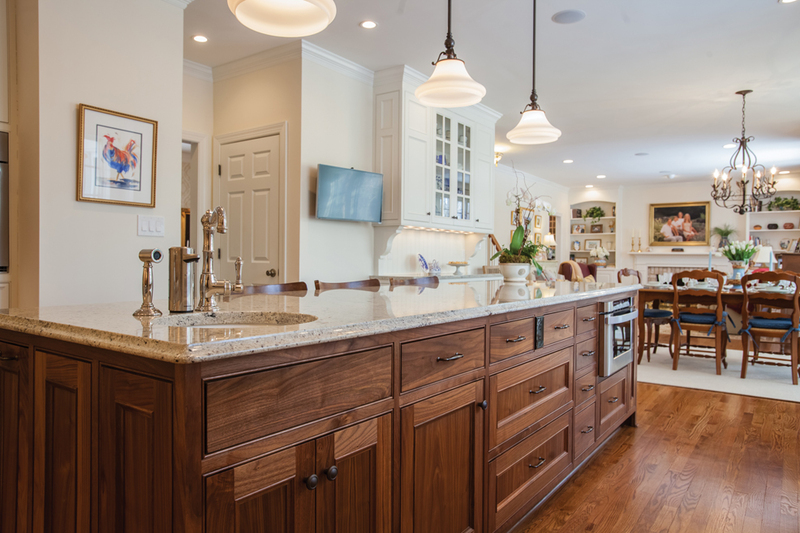 Both husband and wife agree that the renovated kitchen allows for more comfortable and enjoyable family dinners and makes holiday cooking a breeze. Apart from the great cooking tools and breathing room the new kitchen affords, Luke enjoys the cabinets from Tim Columbus at Columbus Woodworks. He especially appreciates the self-closing drawers in the kitchen, “so when [Gail’s] mad at me, she can’t slam the door,” he jokes. 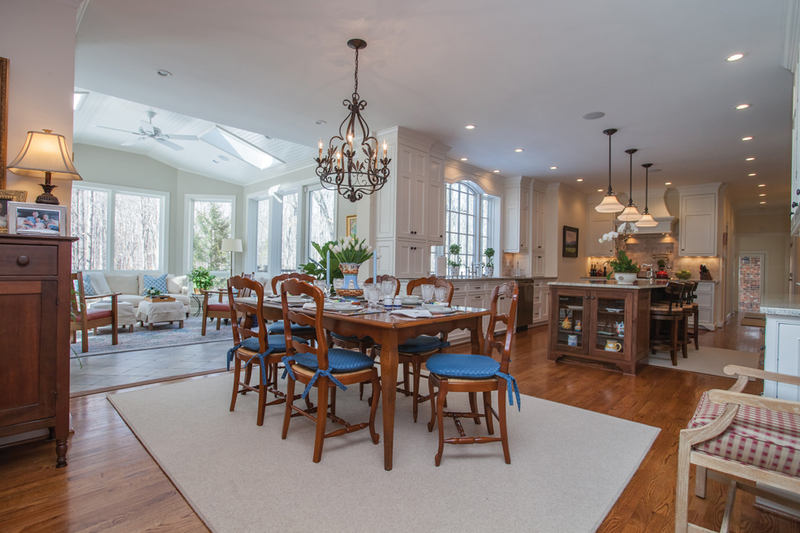 Gail’s favorite aspect of the new space is the natural sunlight in the kitchen that streams in. She’s spotted foxes, woodpeckers, and up to a dozen deer at a time from out the kitchen and sunroom windows. “I knew I wanted white cabinets, and I knew I wanted big windows and light, as the kitchen faces the north side of the house—sunshine is at a premium in the woods,” Gail explains. Her previous kitchen only had one small window; now, a painting of the Allegheny Mountains draped in morning mist takes the place of that window. This painting is another that the Van Dykes acquired on a trip, this time to Warm Springs, Virginia. “Bath County is a very special place for us,” they explain, since they honeymooned at The Homestead in Hot Springs. The sunshine gleams in the room of warm white cabinets and walls painted in Benjamin Moore’s Linen White. 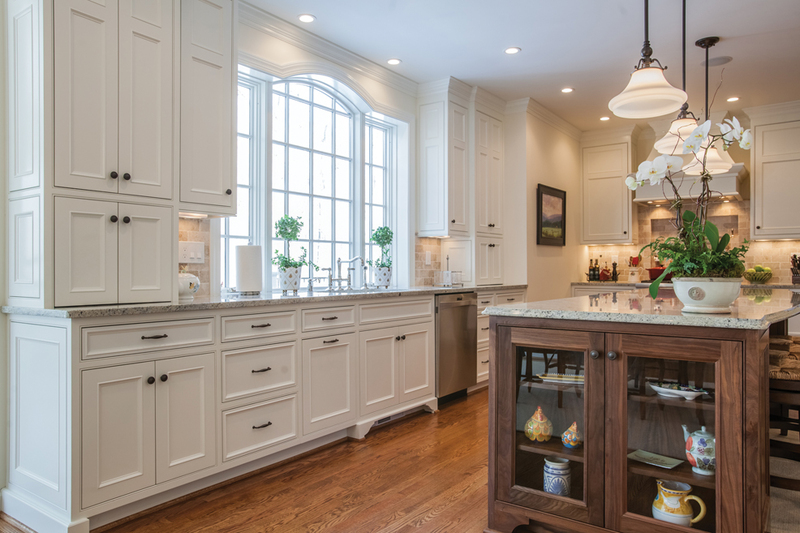 From Pinterest and Houzz to collaborating with the contractor, utilizing the skills of a kitchen designer, and studying magazines, Gail used “all of the above!” to create their dream kitchen. The Van Dykes had anticipated a few months of the renovation, but the project took longer than expected. “We’d run into glitches, but the contractor was great and accommodating and would tell us ‘no problem, we’ll fix it,’ and he did,” Luke says. So just how do you go about cooking and living in your home while major demolition and renovations are taking place? “We used our refrigerator and our old cabinets and recycled them into a kitchenette downstairs—it was our youngest son’s idea,” explains Luke. They used a slow-cooker and cooked on an electric eye. “We made lots of soups and stews,” Gail says. One would think Gail would have grown tired of crockpot cooking, but the slow-cooker still has a place in her walk-in pantry. The new master bedroom suite lies directly off of the kitchen. The Van Dykes use this room currently as a guest room for their parents and other overnight visitors. 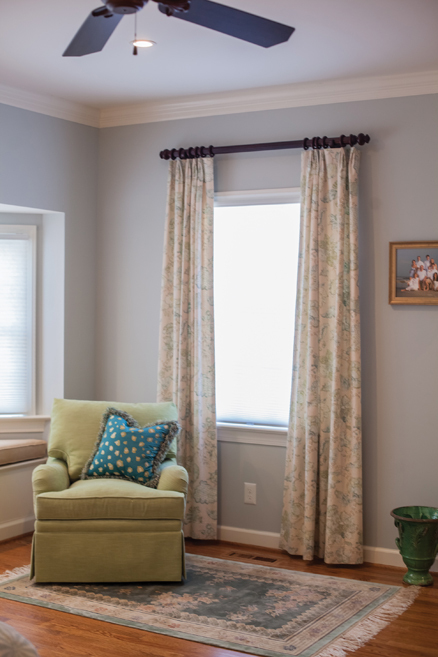 A room decorated in soothing hues of pale blues and greens (including Benjamin Moore Pale Smoke), the couple used an oil painting they picked up on a trip to West Virginia as inspiration for the color palette. “It reminded us of home,” Luke says of the mountain scene. The space seems to have been designed with rest in mind—a perfect retreat for relaxation and slumber. You can just imagine yourself curling up in the charming window seat. Gail is looking forward to reading with her grandchildren in that very spot. “It will be fun to read with them there, and I plan to put toys and books and other fun things in the drawers,” she says. No master suite is truly a suite without an adjoining bath, and this is no exception. The bathroom is a spa-like retreat, adorned in marble and natural sunlight, and with heated floors. The walk-in closet space holds more than just linens—it currently serves as a storage unit for all things grandbaby, including the children’s high chairs, playpens, and a table and chair set. A short walk through the new breezeway leads to the new garage. “The contractor joked that it’s the dog’s house since our dog Charlie stays out there,” Luke says with a smile. If this is the dog’s house, then it’s truly the dog’s palace: the space is heated and has a separate loft bedroom and bathroom upstairs. The power in the garage works on a generator that’s hooked into a propane tank, a decision inspired by the 2012 derecho. They’ve also hooked their new refrigerator into the generator. “When you’re out in the woods, you never know how long it’s going to be before the power comes back on,” Luke says. “We had a few trees down, but thankfully we didn’t have any tree damage to our house,” says Gail. At the time of the storm, the Van Dykes were out of town, and Luke’s brother kept coming by the house to keep things going. 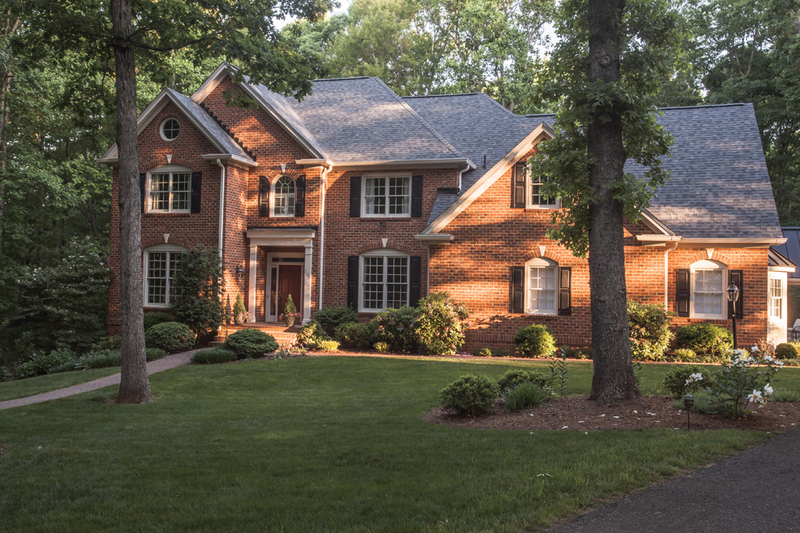 Family was one of the reasons that Gail and Luke came to Lynchburg, and their growing family is the main reason they decided to undertake more than a year of demolition, replacing and renovating. Now, the Van Dykes have exactly what they had hoped for: a better place for cooking and sharing meals with their loved ones, a larger space in which to entertain friends, children, and grandchildren, and a way to enjoy the space they call home for years to come.